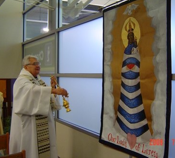 Midway Chapel’s new image of Our Lady of Loreto is blessed at the 20th anniversary Mass. Cardinal George celebrates Mass on the 50th Anniversary of the O’Hare Airport Chaplaincy, Nov. 1, 2010. Fr. Zaniolo, President of the National Conference of Catholic Airport Chaplains greets the Holy Father.